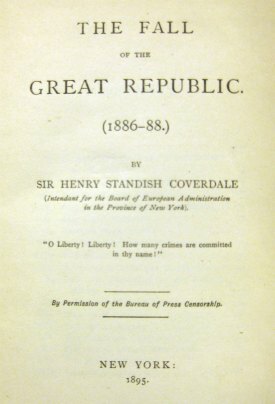 Title Page of The Fall of the Great Republic. It’s not often that we acquire two copies of the same work at the Library. 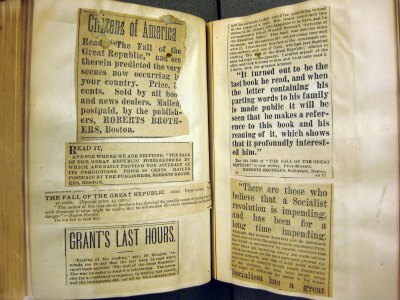 Sometimes, however, a second copy can have unique characteristics that make it nearly irresistible—as in the case of a copy of The Fall of the Great Republic recently acquired for the Glenn R. Negley Collection of Utopian Literature, which may have solved the 125-year-old mystery of its author’s identity. Clippings pasted into The Fall of the Great Republic. The volume was discovered by a bookseller cleaning out of the attic of the Hitchcock House in New Lebanon, now a bed-and-breakfast inn. It has now found its permanent home at Duke, where it will remain a one-of-a-kind resource for future generations of scholars. Special thanks to Garrett Scott for permission to quote from his description of this item. Previous PostThe King’s LetterNext PostHappy International Women’s Day!